Address: Air Headquarters Islamabad (Directorate of Revenue Record) Sector E-9 Islamabad. At this page, you’ll get Air Headquarters Islamabad Jobs 2018 PAF Civilian Career Opportunities. How to Join PAF as Commissioned Officer/Non-Commissioned Officer or as Civilian is a very common question among the job seekers in Pakistan. Every month numerous jobs announced in Pakistan Air Force but there many individuals who do not know how they can apply for these vacancies. 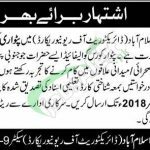 Today at this page we’ll discuss the latest Air Headquarters Islamabad Jobs 2018 which is looking to recruit Patwari for Directorate of Revenue Record. Applications are invited from the educated and disciplined individuals for the above-mentioned positions. Those who are interested to apply should hold PATWAR Course and should belong to South Punjab and maximum experience in the relevant field. So, viewers take advantage of this opportunity and apply as soon as possible because if you were selected then handsome salary and fringe benefits shall be offered as per the policy of Pakistan Air Force. Applications/Bio-Data and all other documents should reach the following address given below. Late/Incomplete applications will not be entertained.